Hotel industry fundamentals are good, and will continue to improve. But the hotel industry is being punished by the disconnect between the investment community of Wall Street and actual performance of the hotels on Main Street. More on the nature of this disconnect shortly, but first, here is the current situation as summarized by Vail Brown of STR last week at the 26th annual Los Angeles hotel investment conference, Meet the Money®. Note that the actual results for 2015 and the forecast for 2016 and 2017 are pretty good – not as spectacular as they have been in some recent past years, but very sound in terms of long-term trends. Notice also that the average national supply growth is still below the 2% level that raises concerns for oversupply. Demand growth is continuing at a rate greater than supply growth, and that is healthy. 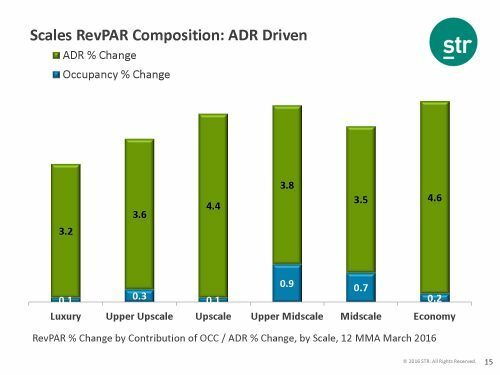 While occupancy growth is modest, strong ADR growth is driving RevPAR growth at good levels. National average statistics are most informative when variations from the median are relatively small. Also, averages can be misleading when there are statistical outliers or even significant variations. That seems to be the case currently, with markets like New York City and Houston struggling, and significant localized damage in oil patch markets. This problem is illustrated by this slide from Vail Brown’s presentation at Meet the Money®. Note that the declining RevPAR growth in New York City and Houston dragged down the entire industry averages. Many industry leaders believe that New York’s problems have also overly influenced the financial community’s perspective on the hospitality industry, incorrectly assuming that industry performance in New York City is representative of the entire industry. Here is what this slide tells us. Total US RevPAR growth in March, 2016 was +2.7%. 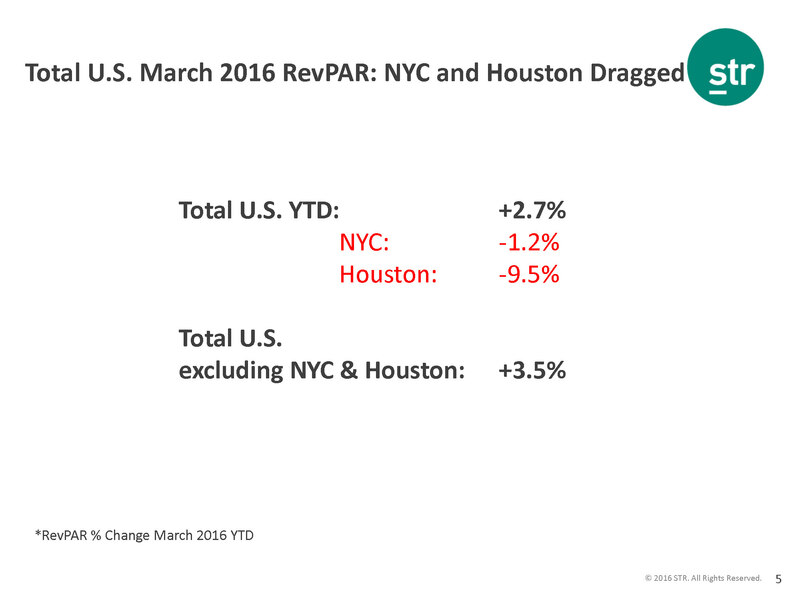 But NYC had negative RevPAR growth of -1.2% and Houston had -9.5%. If you take these two cities out of the calculations, then total national RevPAR growth in march was +3.5%, instead of 2.7%. 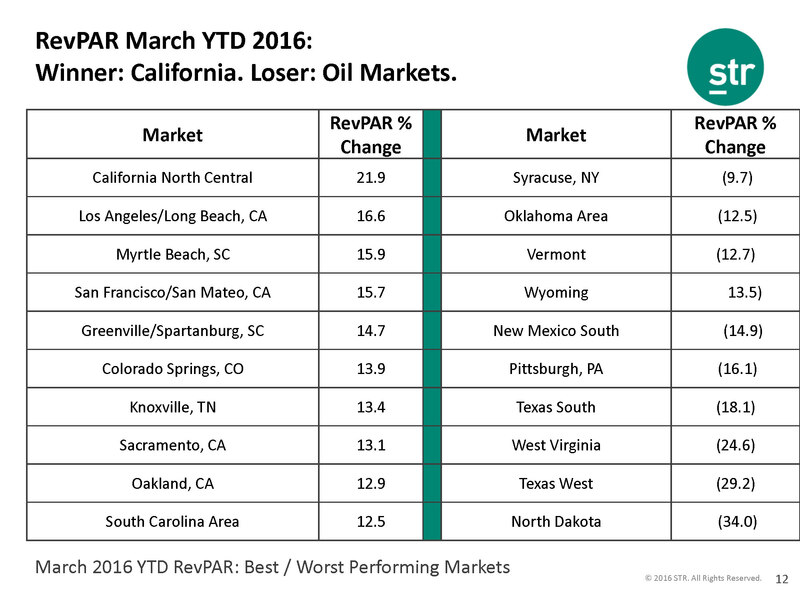 But the variation by market can be very large, with year-to-date RevPAR growth in top markets ranging from 12.5% to an eye-popping 21.9% for California North Central. Revenue per available room or RevPAR has 2 factors for its calculation – occupancy and rate or ADR. Although RevPAR growth continues at a healthy rate, in the early stages of the recovery, it was driven almost completely by occupancy with little or no contribution coming from rate. Now RevPAR growth is being driven by ADR increases with relatively little contribution from occupancy growth. The following slide from STR illustrates this. 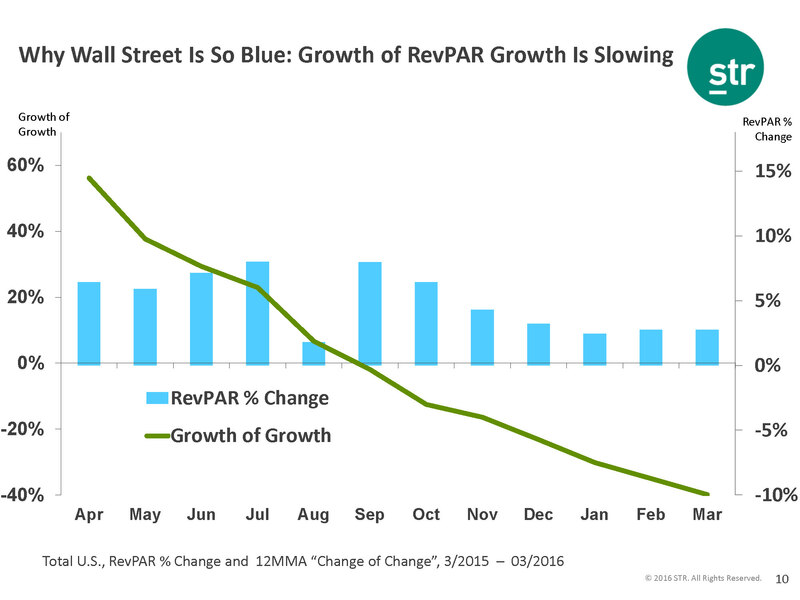 RevPAR growth is slowing – are we nearing the end of the cycle? RevPAR growth has now been sustained for 73 months, and some worry that the current recovery is getting “long of tooth.” Furthermore, the rate of RevPAR growth has declined significantly, and this decline in the growth rate (although RevPAR is still increasing) has caused Wall Street analysts to look on the industry with disfavor because it has lost the spectacular growth rate it enjoyed when the recovery began from the greatest downturn in history. The absolute RevPAR growth rate and the rate of change in this growth rate are illustrated in the following chart from STR. Some of the industry leaders at the Los Angeles conference were excited about the opportunities that the current market presents. Some believe that the challenges and uncertainties now make it possible for “mere mortals” to identify opportunities and make reasonable acquisitions. Many said that this is when the fun begins as generalizations become unreliable, and opportunities are located street corner by street corner or property by property. This position is supported by the wide variations in RevPAR growth referenced above and by similar disparities in ADR growth, new supply, barriers to entry and other relevant considerations. For example, in some strong markets like San Francisco, Los Angeles, and Tampa, Florida, street corner by street corner — at least city by city, and market segment b are experiencing ADR growth rates of 7%-13%, while New York had a negative ADR growth of -3.1%, trailed by Chicago at -1.9%, Miami at -1.7% and Houston at -1.5%. 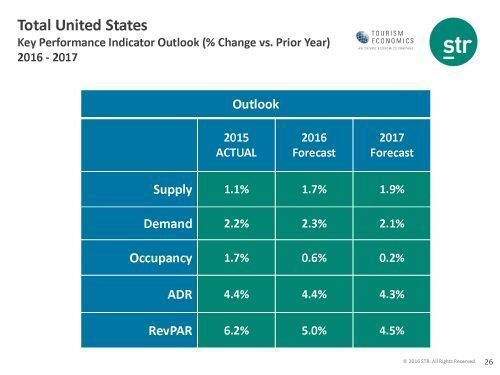 Of course, significant increases in supply often have a negative impact on occupancy and rate. But it is interesting to note that in the top 26 US markets, 24 have supply growth of 2% or more (generally regarded as a point of concern on possible excessive supply). New York City has 15,145 new rooms on line, or more than 14% of existing rooms supply! Other cities with notably high increases in supply include Miami with 8% increase, Denver with 7% increase, and Houston with 7% increase. To understand a market’s potential, you may have to dive under the hood a bit. For example, some markets with big supply increases are adding major new inventory on top of many years of such growth. Other markets like Los Angeles have not had significant new supply for more than 20 years, so even a jump in supply may be absorbed in such a market, particularly with Renaissance in DTLA. There was an interesting spectrum of reaction to the current market situation at the Los Angeles investment conference last week. A number of industry leaders felt strongly that the “disconnect” between Wall Street and Main Street could result in the hotel industry talking itself down unnecessarily. A number of owners and investors think that the uncertainties may rationalize pricing and increase the possibility of acquisitions at realistic prices. Alan Ray of Atlas hospitality thinks that if your are a seller, you missed the peak of the market 6 months ago and should sell now, but it’s a great time to be a buyer. Although financing continues to be available for quality projects, it appears that underwriting standards are tightening and financing is getting more expensive. While construction financing is still difficult to find, we had a number of active lenders and investors for construction deals. According to Jonathan Falik of JF Capital Advisors, the real risk is not the interest rate increase, but the increase in spreads that will be charged above interest rates. In other words, maybe the base interest rate will go up 100 basis points in the next few years. That could pale in significance to an increase of several hundreds of basis points in the spreads charged. For another perspective on what to expect in the hospitality industry’s future, take a look at this List of key takeaways from Meet the Money® by Steve Van of Prism Hotels & Resorts. There is no doubt that we have some interesting times ahead. Whether they portend danger or opportunity is in the eye of the beholder. Certain highlights of the Conference were nicely described by Jeff Higley in his article Meet the Money: Owners must scrutinize assets’ future, and by Stefani C. O’Connor of HotelBusiness in Optimism more cautious at Meet the Money conference. We’re hearing that this was the best ever Meet the Money®, and we’re looking forward to hosting the conference again in 2017. Mark your calendars now–Meet the Money® 2017 will be held at the Hyatt Regency LAX on May 8-10, 2017. See MeetTheMoney.com. Our Perspective. We represent hotel owners, developers and investors. We have helped our clients find business and legal solutions for more than $87 billion of hotel transactions, involving more than 3,900 properties all over the world. We bring this experience to any hotel project — big or small. Let’s explore how it might work for you. For more information, please contact Jim Butler at jbutler@jmbm.com or +1 (310) 201-3526. Jim Butler is a founding partner of JMBM, and the founder and chairman of JMBM’s Global Hospitality Group® and Chinese Investment Group™. He is recognized as one of the top hotel lawyers in the world and has authored or co-authored The HMA & Franchise Agreement Handbook, How to Buy a Hotel Handbook, and The Lenders Handbook. Jim has led the Global Hospitality Group® in more than $87 billion of hotel transactional experience, involving more than 3,900 hotel properties located around the globe.